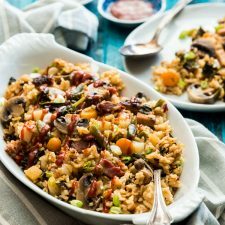 The Instant Pot rice pilaf is loaded with veggies and tastes even better than fried rice. You only need 10 minutes to prep before hitting a button. Your one-dish dinner will be ready in 15 minutes. One of the greatest things about being a food blogger is that you’re constantly exposed to new things and forced to learn. A month ago, I first heard the term “Instant Pot”, from Kathy Hester, the blogger and cookbook author behind Healthy Slow Cooking. A few days later, when my reader and friend Chin mentioned it again, I immediately purchased one from Amazon to play with. The Instant Pot is a very trendy electric cooking appliance that combines a slow cooker, pressure cooker, rice cooker, yogurt maker, steamer, and saute pan. I know this sounds too good to be true. I was very suspicious about it at first. The Instant Pot I got was $114. It is not that cheap, but considering the functions you get, it’s way cheaper than buying all those appliances separately. When I told Thomas about this, he said there was no way this pot could create better rice than our rice cooker. We invested in a high-end Zojirushi rice cooker when moving into our new house in Austin. The same kind that my mom has been using for years. We use this rice cooker to cook brown rice and sushi rice, and they come out perfectly every single time. The rice cooker cost $300. That’s why we thought there was no way the Instant Pot could beat it. The Instant Pot proved me wrong. In fact, I found my Instant Pot creates even better rice than the rice cooker! The secret is to use high pressure (not the “rice” program). Not only is it faster, but it also releases flavor from the rice and makes it tender and sticky. 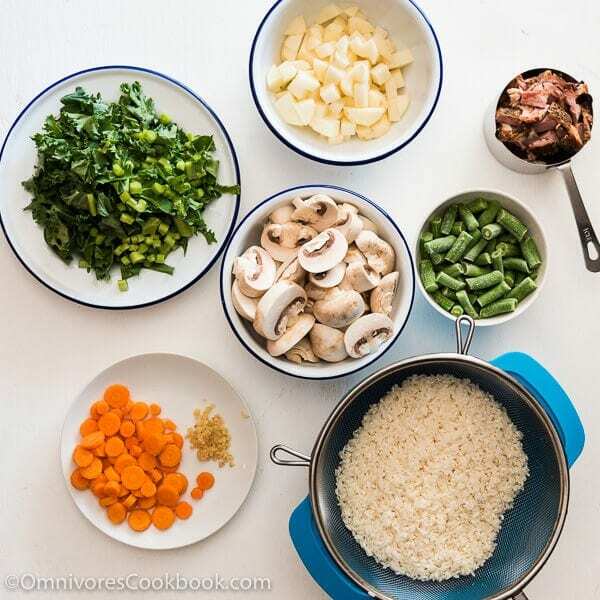 Today I want to share a super cool and lazy way to create a healthy one-pot rice bowl. All you need to do is add raw rice, chicken stock, a bit of leftover meat, and tons of veggies into the Instant Pot. Cook it on high pressure for 8 minutes. 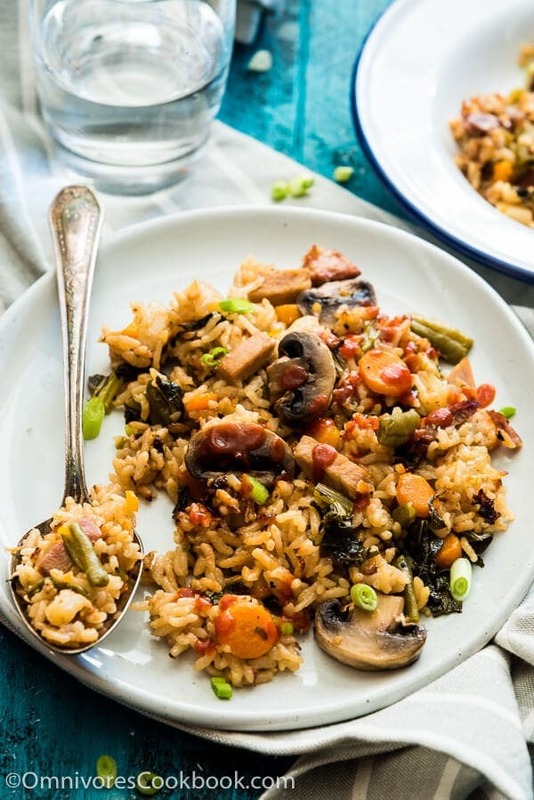 Then you’ll get a pot of Jambalaya-style rice that is perfectly cooked and very fresh in flavor. The texture beats fried rice! The high pressure cooking releases tons of flavor from the vegetables. So even with minimal seasoning, in this case, soy sauce + rice wine + oyster sauce, your house will smell very fragrant when you uncover the pot. I personally recommend you use fresh produce, which always tastes better. But if you’re really short on time, simply buy pre-chopped frozen veggies and cook them without thawing. Everything will be cooked through in 8 minutes. Ready to learn this lazy and healthy one-dish dinner? Let’s start! Rinse white rice with tap water 2 to 3 times. Transfer to a strainer to drain extra water. Cover and seal. Make sure the valve is set to high pressure. Click “Manual” or “Bean/Chili” (Very important). Set timer to 8 minutes. And make sure the high pressure light is on. Do not use the “rice” function. It won’t add pressure that way. If using a stovetop pressure cooker, cook over medium heat until the target pressure is reached. Turn to low heat. Cook at high pressure for 8 minutes. Remove the pressure cooker from the stove. Let the pressure release naturally. Or you can use quick release. Gently mix everything with a spatula. Add oyster sauce and green onion. Mix again. Adjust seasoning by adding more sauce, if necessary. If you’re not going to serve the rice immediately, let the pot sit covered. Serve warm as a main. The cup I used in this recipe is the one that comes with the Instant Pot. It is a standard Asian rice cup that is 180 mL. If you’re using American cups (250 mL), you will need to measure 1 and 1/2 cups rice instead. To measure in American cups (250 mL), you will need 2 cups minus 2 tablespoons chicken stock. Soy sauce chars the bottom layer of the rice. But if there is too much soy sauce, it will cause some rice to burn. Please do share! I make yogurt about 2-3 times a week for our family. I love how easy my maker is but if I could replace 3 items (rice cooker, yogurt maker, pressure cooker) and just store one in my kitchen, that would be a plus! Beth, I make yogurt weekly with my instant pot Duo. I use about a gallon of whole milk, about a teaspoon of plain yogurt with live active cultures, and I strain it so my result is a good half gallon of thick creamy yogurt. I’ve had two instant pots for over a year and can’t imagine my kitchen without them now. I have tried a few of your recipes and they came out delicious. Do you mind to post/email the recipe for Chinese fermented glutinous rice using Instant ? Thank you. Yay! Excited to see more amazing Chinese recipies from you featuring the electric pressure cooker!! I can’t wait to try out this rice one. I assume left over chicken is already cooked? And thanks for the info on the different cup sizes! I never knew! Game changer!! I adore one pot awesomeness like these!! As Indian rice is a way of living for us and I am soo going to try this. Need to go buy some shrooms now! This recipe sounds awesome! I’ve been using a multi function electric pressure cooker for the past year. It is my new obsession. 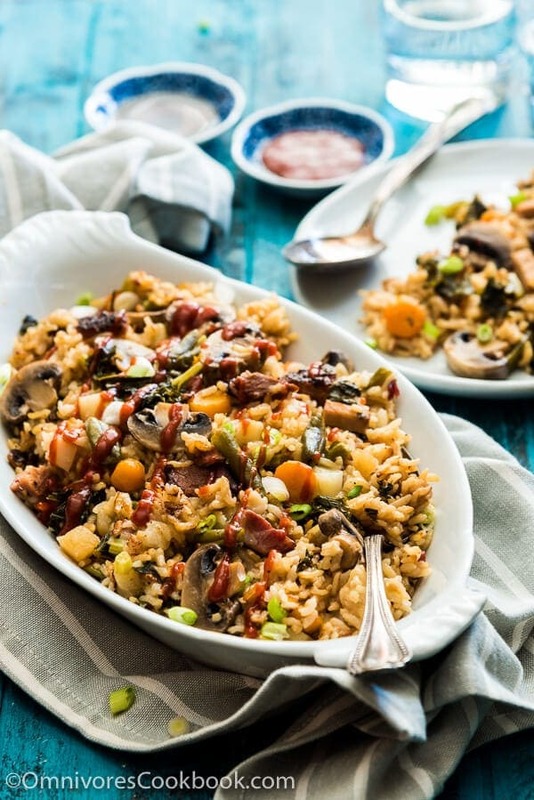 Could you use this type of recipe with long grain brown jasmine rice? How about Thai black rice? Would the measurements and results be similar? 1) Cook the rice with proper amount of water first, for about 20 minutes. Then you use fast pressure release, add the vegetables, and cook with pressure for another 5 minutes. The only thing I’m worried about is, the pressure cooker will be using high heat to add pressure after you add the vegetables. There is a chance to burn the rice on the bottom. 2) Soak the brown rice (or black rice) overnight, so you can cook it through in the pressure cooker in 8 minutes. I think this is the better solution. This sounds yummy, I haven’t used the instant pot I have yet maybe this will be my first try. You mentioned mushroom sauce instead of oyster sauce. Do you have a recipe for that or know where to find some ? Thank you for all your hard work and for sharing. It is a vegetarian version of oyster sauce. Thank you so much. I am loving your site. Hi! Not sure if I’ll get a reply in time as I plan to cook this dinner tonight. 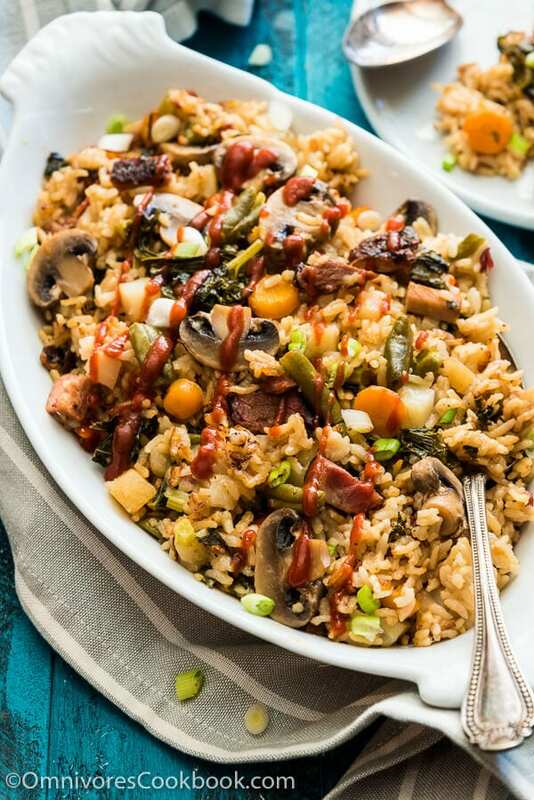 My question is can I increase this recipe to 3 cups of rice, and if so would it be a proportionate amount that I would increase for the rest of the ingredients? Hope to hear from someone soon. Hi Kelly, yes you can increase the rice to 3 cups (180ml-rice cups), and increase the rest ingredients by half of the original amount. Jut be careful, you should not fill the instant pot (or pressure cooker) over two third. If you find the pot is getting full at the end, you can slightly cut the vegetable amount. Thanks Maggie! I wasn’t able to make this dish last night , too much going on. But I will attempt to make this dish tonight, it will be my first time not only with this recipe but also using my instant pot which I just got last week! I don’t have all the vegetable ingredients and don’t have waxy potatoes comma so I will estimate and make sure that it doesn’t go over two-thirds of the pot. I’ll let you know how it goes. Thank you so much, you’ve made me a fan! Maggie, it came out delicious! Thank you so much! So happy to hear it Kelly! Can you tell me what the “mushroom sauce” is that your recipe calls for? The Asian market I went to near my house only had a Mushroom soy sauce which I used in the recipe but I’m not sure that is what you intended. Hi Rebecca, the mushroom sauce is a vegetarian version of the traditional oyster sauce. The main ingredient is shiitake mushroom and has the similar umami of an oyster sauce. Sometimes it’s labeled as Vegetarian Mushroom Flavored Stir-fry Sauce. I think the mushroom soy sauce can be a good replacement too. This came out very undercooked for me, even with a 20-minute natural release. The rice was slightly underdone. The potatoes were still crunchy. The mushrooms and kale were basically raw. I wonder if the quantities of the vegetables had something to do with it. The ingredients came pretty much up to the top. A whole lb of mushrooms takes up a lot of room. I also used frozen green beans if that makes a difference. Hi Joe, I’m sorry to hear the recipe did not work for you. Could you let me know what type of rice you used? If you are using medium grain or long grain, there is a chance that you didn’t use enough water. Yes the vegetables fill up the pot, but they cook down fast using the steam and they will release liquid as well. When I make this dish, the green vegetables are usually a bit overcooked. So if yours came undercooked, I suspect you need to add more water to make it work. Yes, I used medium grain rice. I tried making the instant pot rice pilaf. The IP never built up any pressure. I thought it was malfunctioning and tried again – still no luck. It went through the preheat and started into the 8 minutes of cooking, but the valve didn’t pop up and no pressure built up. I stopped the IP right away both times. When I opened it up, all the fluid was absorbed into the rice and a layer had burned onto the bottom ( I had heeded the advice not to let the soy sauce get to the bottom). We did careful measure the chicken stock and the rice. (360 mL of rice and 450 mL of chicken stock). The meal looked great on the pictures on the site, but bombed big-time in real life. Can this be cooked on the stove top in a regular pot ?